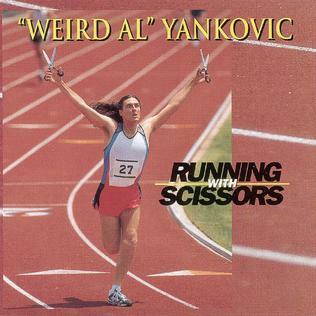 Cover of "Weird Al" Yankovic's Running With Scissors album. As part of the Yahoo! Music Beatnik GrooveGrams Contest from November 18, 1999 to January 10, 2000, "Weird Al" Yankovic released an official remix of his song "Pretty Fly for a Rabbi", a parody of The Offspring's "Pretty Fly (for a White Guy)" from Yankovic's 1999 album Running with Scissors. This remix was released only on the Yahoo! Music Beatnik site as part of the contest promotion and has never appeared elsewhere. The software used to remix the song, the now-defunct Beatnik, was made by Thomas Dolby. In January 1999, Beatnik partnered with Yahoo! for Beatnik GrooveGrams . As part of the partnership, the Yahoo! Music GrooveGram Contest was born. U.S. residents were eligible to remix a variety of songs from artists such as Britney Spears, Puff Daddy, and "Weird Al" Yankovic, among others. Available prizes included signed albums, event tickets, and in the case of “Weird Al”-- a signed accordion. The contest timeline for remixing "Weird Al"'s song was November 18, 1999, 12:00 p.m. PST to January 10, 2000, 9:00 a.m. PST. Due to the functionality of the Beatnik software, users did not end up with a hard copy file of their music creations, and thus any Beatnik remixes were lost when the contest page on Yahoo! Music was pulled down.